From piazza Cavour take via Gaudenzio Ferrari and head to the Basilica di San Gaudenzio and the Cupola (Dome). A few facts: the Cupola is 121 m high, it was made by architect Alessandro Antonelli, and it is reckoned as one of the highest brick dome in the world. 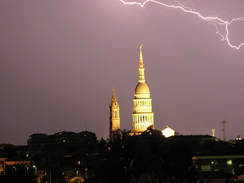 Works started at the beginning of 1844 and ended in 1887 when the statue of The Saviour (Il Salvatore) was placed at the summit of the dome. If you go and visit the Dome you can still see the incredibly big compass that was used to do the measurements – its ray is 11 m long! 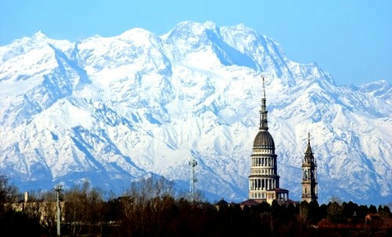 The other world famous work by Antonelli is the Mole Antonelliana in Turin (finished in 1889). The beauty of the Dome has always attracted many visitors. Among them the Russian writer Fedor Dostoevsij, who travelled to Italy with his second wife in September 1867, and asked to be taken to Novara to admire Antonelli’s dome (still unfinished), having heard about it from a friend in Geneva. Dostoevskij had studied at the Military Academy of Engineer in St Peterburg and was very interested in art and architecture. When in Novara he went to observe the bricklayers at work and drew a sketch of the cupola on his notebook. 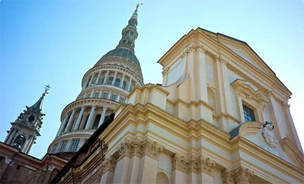 The legend has it that when in 1841 Antonelli was commissioned the work to add a dome to the patron Saint’s church, the architect had the whole project in his mind. Nevertheless he was perfectly aware that nobody would have supported his ideas in a small town like Novara. It was too risky and too expensive. So he decided to lock his drawings in a safe place in his studio, and presented the city council some more realistic drawings, in tune with his clients’ expectations (1st design). 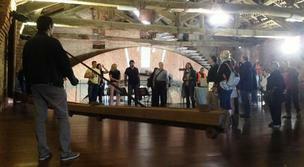 The work started and after a few years, when the scaffold was dismantled, no change had been made, apparently. The Novaresi wondered where the dome was, and most of the investors asked where their money had gone. Antonelli explained that he had used them to reinforce the structure of the building to hold the dome that still had to be made, but for which he needed a second contract. People were not happy but they could not leave the church the way it was, so they granted him a second contract and when all the money was collected works started again (2nd design). But even this time Antonelli had no intention of really making “that dome”. 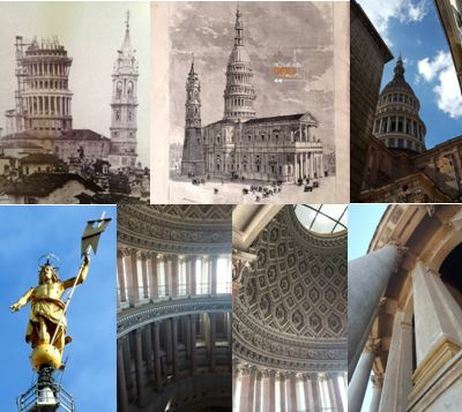 So, when the scaffold was disassembled again, the dome was not finished and only an order of circular columns stood above what was still an open space. The city authorities were really mad with him, but at that point they could not do much, as the church did not have a roof. So they ordered him to finish his work and signed a third contract (3rd design). Another ten years went by and a second order of columns was established. Only at this stage Antonelli took out his original drawings since money had finished again (!) and he needed a fourth contract (4th design). That was luckily the last one. After forty years, in 1887, the dome was finished, and looked exactly the way you can admire it today. There were just a few details to be completed and, shortly before dying, Antonelli left the task to his son. Today, thanks to the bold vision of a great architect and artist, people from Novara can be proud to have a very special city skyline. According to some scholars, the famous Spanish architect Antoni Gaudi had read some works by Alessandro Antonelli and was quite interested in his daring building technique. For sure, the two architects shared the same interest in vertical constructions.